- The Guard Change may not be operational in bad weather conditions. On these occasions we will visit the Horse Guards for a photo stop instead. - On 7, 9, 10, 16, 17 February 2018 Greenwich Pier will be closed. We will operate the tour with a boat ride from Tower Pier to London Eye where the tour will end. Start your day with a panoramic tour of London! Sit back as your driver and guide take you through the city and past some of London’s most famous sights. You’ll stop at Westminster Abbey, so you can get that all-important photo of the spectacular church where William and Kate were married! The tour will then reach St Paul’s Cathedral, the huge domed church in the old City of London. Designed by celebrated architect Sir Christopher Wren, St Paul’s Cathedral is full of historical delights. Enjoy time inside St Paul’s Cathedral and see the beautiful architecture, stained glass windows and tombs dedicated to important figures in British history. 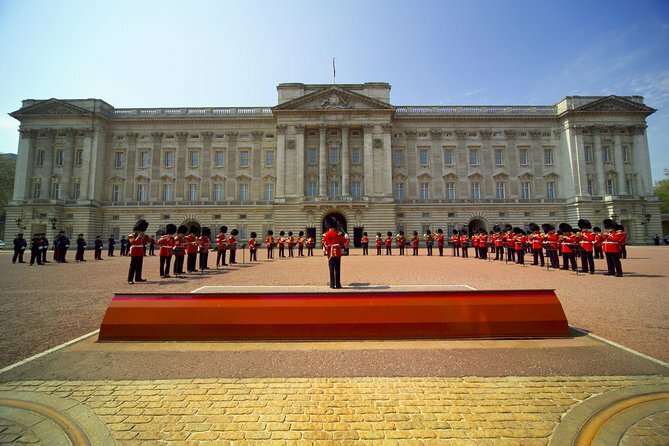 You will then head to Buckingham Palace for the charmingly traditional Changing of the Guard ceremony. This regular occurrence involves the brightly dressed Queen’s Foot Guard changing shifts in spectacular fashion. The guards march alongside a military band as they return to the Palace! Lunch packs will be included. The 1,000 year old Tower of London has a history you have to see to believe! You’ll have plenty of time to explore this incredible fortress during our extended afternoon visit. Enjoy free time to explore the Tower of London as you wish, learning about its fascinating past. The Tower of London has been used as a palace, royal mint and zoo! See the gorgeous Crown Jewels, kept under lock and key in the Jewel Tower. Meet The Beefeaters, or Yeoman Warders, are the Tower of London’s official guardians! Hear the tales of the Beefeaters during your exclusive tour with one of the Tower’s working Yeoman Warders. Listen as the smartly-dressed Beefeater recounts stories about their often grisly role in keeping watch over the Tower of London’s prisoners. Luckily, this isn’t part of their job description anymore and these important people are all retired members of the Armed Forces. Break out of the Tower of London for a River Thames Boat Ride. This scenic trip down the Thames will show you some city sights from an entirely different perspective as you cruise towards the London Eye. Finish your London day trip on a high! See London from the skies during a flight on the iconic London Eye. Your tour will finish at approximately 6pm at the London Eye. Tony was a fantastic guide! Very knowledgeable and helpful. Loved that they started at Buckingham Palace so we could get great pictures before the crowds arrived! Our guide was very knowledgeable. He knew the history and interesting facts about sites in London. He was also very entertaining! Great tour. Includes the highlights of London. The tour gave us a good insight into the main attractions of London. We spent a good amount of time at the Tower of London and at St Paul's Cathedral. We did quite a lot of driving around the streets and also took the water bus on the Thames to a couple of attractions. The packed lunch was a cheese sandwich, bottle of water and packet of crisps and you could have purchased more food at the Tower of London if needed. The tours ran on schedule and finished at the London Eye. Our tour guide gave us detailed information on how to find our way back to our accommodation. An enjoyable day. The London Eye is outstanding. I would have liked more opportunities to get off the bus and take photos especially since the buses are unable to drive in some places. I booked this tour on September 10. Tour was basically as providing the transport and tickets to the attractions. The guide Mr David kept talking to a family in Spanish most of the time while the majority of tourists were English speaking. The tour can be upgraded by providing whispers or similar devices so the visitor can follow what the guide is telling even they are behind. It was very hard to hear what the guide was telling. Also the River cruise was on the commercial passenger water taxi not a cruise with guide or narration with no narration by guide. We were taken to Greenwich 30 minute to go and 45 minutes to come back. We were given only 15 minutes to explore a navy museum children learning center. It was waste of time. I was disappointed in tour. Very large tour group, guide was more interested in saving time that showing the sights and telling history. The eye of London ended the tour. Tickets were not skip the line and the guide left with little to no instructions as to how to exchange vouchers for tickets. Started with upper level complaining loudly about not hearing. Got worse when we had to walk a long way to Changing of the Guard. Lost track of the guide. Finally found him. Checked in. He had a phone call to find another lost member. He never came back. We got left there. We were told they had gone on to the Tower of London and we had to make our way there. Couldn't find them there. No one answered the phone. We have yet to see the afternoon stops. Very poorly handled. Unfortunately not a great tour. Our guide, Tony admitted it was not his finest hour. The tour was rushed. Greenwich village skipped because he allowed group of four delay tour for an hour while the rest of the group waited like homeless on the street. Not recommended for price.